Yes, one of the most common pains caused by mountain biking is tennis elbow or tendonitis. Of all the different stresses and strains that the body undergoes this one occurs the most to riders. There are a number of things which can cause elbow pain from riding your mountain bike. First you are riding your bike in a non neutral position. This means you are holding your handlebars wrong by extending your wrists. By extending your wrist toward your forearm you are flexing your forearm muscles and tendons. This constant extension will over work the forearm tendons at the elbow causing pain. Your handlebars may be turned up which also causes wrist extension. This places extra stress and weight on your forearms and tendons. Your seat or saddle is not level. It is tilted forward or angled downward. This will cause more of your body weight to be supported by your hands and forearms. You do not have enough bar tape on your handlebars in order to cushion your hands and forearms. Your posture seated on your bike is incorrect because your back is rounded and your shoulders are turned in. This causes your arms and elbows to turn in putting pressure on the outside of your elbows leading to strain and pain. You are not properly balanced on your bike. You might be too far forward or too far to the right or left. This will put too much strain on both forearms and wrists or too much stress on the left side or right side. Your back is not strong enough. As you mountain bike the rider needs to pull on the handlebars a lot in order to maneuver through the trail. To go over jumps, bumps, small obstacles, and to do wheelies you have to do a lot of pulling. If your back muscles are not strong enough they will not be able to stabilize the shoulder joint during a pulling motion. This will cause your rotator cuff to not be as strong as it should be. Which then strains your elbow tendons and forearms leading to pain. The most common one is you have a pain on the outside of your elbow which in time could become a sharp pain. Another is you feel pain when you grip your bike handlebars. Or you feel pain whenever you pull up on your handlebars in order to go over any small obstacles. Even your shoulder or neck hurts due to pulling and weakness leading to pain at the outside of your elbow. The first thing to do would be to stop mountain biking, continuing to strain it will only make it worse. If the pain is very sharp you won’t want to do anything with it anyway. Put ice on it to stop the swelling and pain. Do this for 15 to 25 minutes every 4 or 5 hours 2 to 3 times a day. Use an elbow strap to protect your elbow and to prevent you from using it. Take medication if you are experiencing severe pain. Such as aspirin, ibuprofen, or naproxen. Make sure you consult with your doctor, these medications may cause side effects. Overall, you can expect to recover anywhere from 6 weeks to 2 years. You may think, wow, that is a wide range of time for recovery. And you would be right. This is because tendonitis is an injury of the tendon. Tendons naturally take longer to heal than muscles do. A lot also has to do with how severe the injury is and the treatment. If your elbow pain is not so sharp and you treated it early then possibly you can get better in a few weeks. But if you really over used the tendon and did not notice the symptoms then it will take a lot longer to recover. In terms of mountain biking, recovery should not be too long. This is because bikers are not doing as extreme and stressful movements as a tennis player or a golfer. You are not making big movements with your arms. The problem is body posture and weak back muscles. No, that would not be a good idea. Riding your bike again to soon can cause you to injury it again. But you should not be completely immobile. This would cause your muscles and tendons to weaken and you would lose blood supply to that area. You can do some normal gentle movements like turning the knob of a door. Even if there is some pain, that is okay. Normal everyday activities are fine. You will have to judge according to how severe your injury is. Some movement is helpful when healing. The best exercises to do first would be back exercises, then shoulder, and then some arm exercises. Back exercises are most important because you need to be able to maintain the correct posture while riding your bike. Lack of correct posture causes the stress and impact of mountain biking to be transferred to the forearms and elbows. Having a strong back allows you to keep your back straight and not curved. Doing barbell bent over rows is an excellent exercise. First you need to be bent over so your chest is nearly parallel with the floor. This forces you to strengthen your lower back. Then using an overhand grip same as a handlebar grip, you pull the bar into your navel or belly button. This will strengthen the upper back, rear shoulders, forearms, biceps, and tendons of the elbow. These are the same muscles and tendons used when pulling on your handlebars, as well as they will also stabilize you on your bike. For shoulders you can do dumbbell flyes to the front and the side. But make sure you use light weight at first. This will broaden your shoulders and prevent them from turning in, which turns in your forearms, which puts strain on the outside of your forearm causing elbow pain. Finally, do overhand grip barbell curls. This will strengthen your forearms and biceps as well as strengthen your grip. No matter which body position you are in while riding you need to make sure your back is straight. Whether you need to lean back, forward or lean from one side or the other your back must be stable and straight. This will allow you to keep your weight centered and balanced. With your back straight your shoulders will be broad and square. The combination of a straight back and square shoulders will keep a lot of the impact and strain away from your elbows and forearms preventing you from injuring your elbows. Lastly, make sure you grip the handlebars loosely. This should be easy because you are sitting on the bike seat with a proper posture. Keep your wrists in a straight position in line with your forearms. 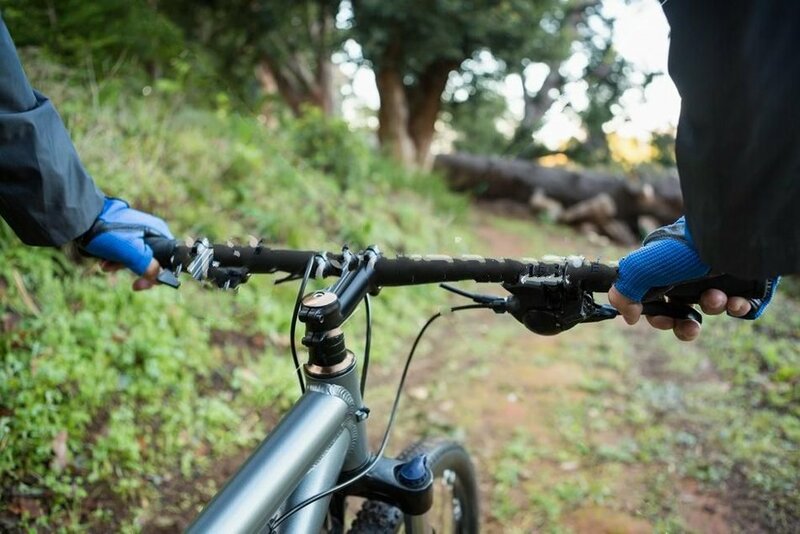 By strengthening the right muscles for mountain biking and maintaining the correct posture when riding you should never have any pain on the outside of your elbow. Enjoy riding pain free.